I have received a couple of emails asking about hair thinning and hair loss (not relaxer related but for natural hair). I am happy to do the research on these subjects but I'm interested to know if as a general audience this is something that you would want to hear about. If you have specific questions that you would like answered, feel free to comment here! I decided to transition to natural mainly because of the thinning hair in my temple area, particularly the right side. I havent relaxed the hair in my temple area in almost 2 years, have avoided braiding the hair, used rosemary oil, dr Miracle's temple balm, etc, yet I have seen very little improvement. How do I know if permanent, irreversible damage has been done to my temple area? Looking at my childhood pictures, I always had a scanty hairline, and I remember my grandma also had the same problem, so it might be hereditary, right? I really love your blog by the way. I am also a chemist by profession, and its refreshing to see the hair issue approached scientifically. I'd love to know... I've had locs for 8 yrs and I'm trying to transition back to loose natural hair... I've experienced some thinning and would like to know how to get back to healthy hair. Could you also do one on hair breakage? I know the solution seems dead obvious but one never knows right? My friend lost so much hair after the birth of her first baby. She used expensive shampoos and lotions extra for pregnant women, but it didn't help (of course, sigh). Now she just gave birth to her second baby and we wonder if it will happen again, and if she can do anything to support her hair. Also, my mother's hair thinned very badly a year ago. I wonder if it was because she dramatically lost weight. Fortunately it seems to grow back thicker. All my grandmas have thin hair though, no matter how full and strong it was in their youth. I had my son a year ago and three months after his birth I begain to loose my hair in the front. At first I thought this was normal since a lot of women experience hair loss after birth. Fast forwarding some in March of this year I decided to go natural because I figured the chemicals from the relaxer was doing more harm than good and my hair in the front was so thin and transparent. I have been natural for the past eight months, but my hair is still thin in te front middle section and comes out easily when combed. I'm at a lost as what to do and would really like for you to cover the topic of hair loss and how to combat this issue! It is starting to affect my self confidence. This is definitely a subject of interest to me. I have embarassingly thin edges (I slick them back with gel so they're not as obvious) and I'm wondering if it's possible to have PERMANENTLY thinned edges or if they can grow back. They got thin b/c of relaxers/micros and when I did the BC and regrew my hair, it's still thin. It's scary. I want full edges really badly! Please help! i experienced hair loss/thinning while relaxed and the first time i went natural. i don't think that my hair can handle excessive heat and manipulation. 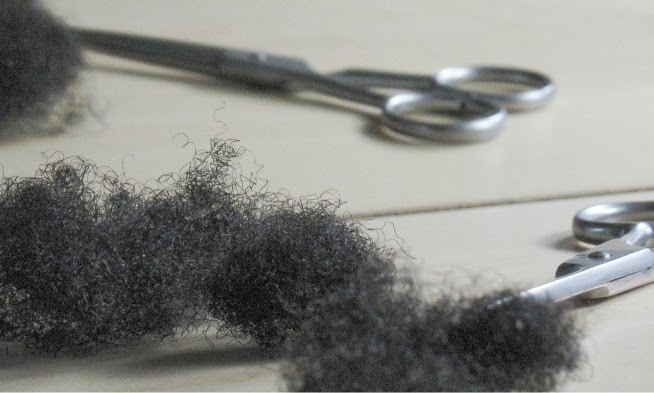 once i decided to go natural and use very little heat, the thinning stopped. however, it took almost half a year for the hair to come back. i read somewhere that it can take 100 days for the folicle to rejuvanate and repair itself if it's not dead. is that true? Oh please write something. I am a healthy 28 year old women and I seem to have sections that just break off to the scalp. For years my hair was thinning in the top and then it started around the hairline. For the last 13 years I was going from dermatologist to dermatologist looking for a reason. i was told that it was from the relaxer, but for some reason I didn't want to believe it and my stylist did not really offer much assistance. About 7 years ago, my stylist stopped relaxing the top of my head, but the thinning was getting worse and then I started noticing I was bald on top. I had to style my hair to cover the bald spot. I saw another dermatologist and was told that it may be from the chemicals, and the only way to know was to stop the relaxers. I stopped relaxing my hair, hoping I would see an improvement. So, about three years ago I stopped relaxing and using chemicals to color my hair. I learned a lot from all of the natural hair blogs and love my hair. Just a side note- From the time I was 21 until 48, I paid someone to shampoo, style and relax my hair every two weeks. I did not see an improvement, in fact it was getting worse. I started investigating and went to several hair loss clinics. I was diagnosed as having male-pattern baldness which is very common in women. It is hereditary, my mom's hair is very thin in places also. I was using Vitamin E oil and taking supplements. Last summer I decided the only alternative was a hair transplant. My hair in the back is very healthy and was 1600 follicles were transplanted to the top and front. It has been almost four months and I am starting to see growth. I also use a laser comb which strengthens the hair follicles- making the transplanted follicles grow quicker and strengthening the remaining hair. I am very pleased with the procedure. It was expensive, but well worth the investment. I will never use chemicals in my hair again. I love my natural hair. ジェシカ - I don't give tailored advice because I am not a medical doctor. I would really advice you to see a dermatologist given that you have had such a massive change to your hair. The no poo method does not work for everyone. If you do a search on this blog you will find a poll where most people do not strictly adhere to it. The oil and flakes are a major reason why many people do feel the need to shampoo hair regularly with shampoo, castile soap, shampoo bars - just some stronger surfactant. Conditioners are great for hair, I personally wouldn't skip that. I think you definitely need to find something else that works. You said you used to have thick hair, what were you doing then? Why did you stop?